Last weekend was the eighth annual Brandon Beer Festival and it was the best edition yet. Most of Manitoba's breweries made an appearance, with two of them making their very first presence this year including Winnipeg Brew Werks and Devil May Care. I keep wanting to call this "Bill Rye, the Science Guy!" instead of "Milled Rye the for some reason, but their name puns are 100% on point, as is the awesome artwork (like as seen in Starstuff). Devise an experimental brew to test limits of brewing equipment and patience of DMC brewers. Use a massive amount of grain to fill mash tun to the brim. Include an insane portion of rye to maximize mash thickness. Brew it to 11, literally. Must be huge and made to age. An enormous, malty ale in the style of a classic barleywine but with a spicy rye-forward twist. Served best from a snifter and let to warm and open up, we think this is the perfect beer for sitting back, exploring our universe, and pondering how to save the world. Oops.. I poured this in their standard glass instead of a snifter! So after taking a photo I poured the beer into a snifter like it recommends! Appearance: Pours a murky tanned leather brown with a moderate amount of light beige foam on top. 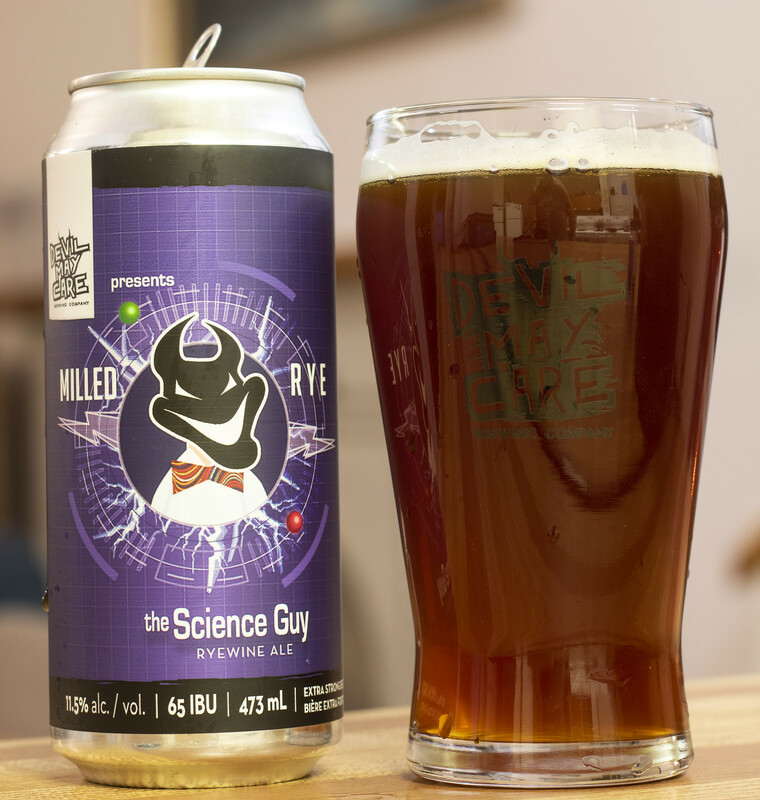 Aroma: The spiciness of the rye comes out right from the cracking of the can. You know the aroma of rye.. right? Well if you don't, it's a nice toasty and mildly spicy grain. The beer is moderately sweet with a hint of bubble gum to it. There's a decent amount of caramel sweetness but not it's not overly over-the-top like many Barley/Wheat/Etc-wines. For this being 11.5%, this is quite light on an aroma.. I know I'm going to be in for a treat once I taste this! Taste: Good amount of caramel sweetness, followed by a very powerful rye malt bitterness that hits the tongue hard, leaving behind a tingling bitter aftertaste to it. The booze really freaking creeps up on you.. quickly! This beer is really deceiving because it's incredibly smooth but it's evil and freaking 11.5% ABV! I'm getting a bit of bitter hop presence in there, mostly mingling with the rye malt. I'm trying to think of if I'm getting any other notes but that's mostly it, there is also a hint of woodiness lingering somewhere but it's ever so faint. Overall Thoughts: A ryewine.. in a can?! It works! This is the first time (that I remember of) that I've tried and I feel that rye needs to be in a loooooot more beers, so I'm giddy that I got to try this! This one was mildly sweet with a bit of a spiciness to it and a hefty bitterness to boot. Comparing this to a Barley Wine: this one is nowhere near "in your face" sweet, some of you may prefer overly sweet but I prefer a moderate amount of sweetness so I'm really enjoying this. Also, you have to love this beer for the punny name and the great artwork by Christellar. I feel winter time is the best time for a "wine" themed beer but if this makes it to Brandon MLCCs, I'll gladly buy many cans for lazy Sundays. Also, Devil May Care's only been selling their beer in Brandon for maybe two weeks now and it looks like people in this Conservative Bud Light town are enjoying their beers quite a bit!